VATICAN CITY (CNS) — Advent’s liturgical preparation for Christmas calls Christians to renew their faith in the reality of God’s great love and to make a commitment to bringing his love to the world today, Pope Benedict XVI said. Addressing an estimated 4,000 people at his weekly general audience Dec. 5, Pope Benedict also asked for prayers for peace in Congo, where continuing ethnic violence and civil strife have led to dozens of deaths and has forced thousands of people to flee their homes. In response to the fighting and “the serious humanitarian crisis” it was causing, the pope called for “dialogue and reconciliation,” and he asked the international community to take action to meet the needs of the Congolese people. 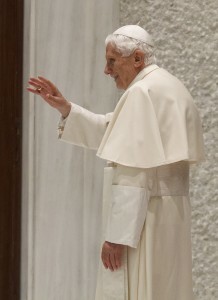 In his main audience talk, Pope Benedict continued his reflections on the Year of Faith, which he opened in October. Accepting God’s love and freely choosing to follow his ways “brings a fundamental change in how we relate to the entire created reality. Everything appears in a new light; it is a true conversion. Faith is a change of mentality because God, who has made himself known in Christ and has made his plan of salvation known, draws us to himself,” the pope said. “Faith is accepting God’s vision of reality, allowing God to guide us with his word and sacraments in understanding what we must do, the path we must follow, how we must live,” he said. “In the midst of many difficulties, Advent invites us once again to renew our certainty that God is present, he entered into the world, becoming human like us, in order to bring to fullness his plan of love,” the pope said. Among the pilgrims at the audience were representatives of an association of Italian bakers and pastry chefs; the pope thanked them for their gifts of “panettoni,” Italian Christmas cakes, which he said would be distributed to the poor.